Today energy efficiency is very important for a variety of reasons. Energy efficient glass saves you money on heating bills and we have all seen those go up massively in the last few years. Energy efficient glass is also very important for helping to combat global warming by reducing the amount of fossil fuels burnt to heat our homes and offices. ASPECT Windows and Doors uses the latest energy efficient glass called Pilkington K™ from Liniar. The Pilkington K glass™ is used in our double glazing units and can reduce the amount of energy lost by up to 90% when compared to single glazing. Pilkington K Glass™ is the UK's leading solution for thermal insulation in homes and office. It is a low emissivity coated glass which is easily stocked, processed and installed. Pilkington K Glass™ has been available for over 15 years making it the trusted solution for meeting energy efficiency regulations. Pilkington K Glass™ is usually used for the inner pane of an insulating glass unit such as the latest energy efficient glazing, Pilkington energiKare™. The coating used on Pilkington K Glass™ works by reflecting heat back into the room while also allowing heat from the sun to pass into the room. Windows incorporating Pilkington K Glass™ achieve high Window Energy Ratings and are complient with the energy saving Building Regulations Part L.
Heat travels in three ways; conduction, convection and radiation. Windows with single panes of glass easily conduct heat to the outside air. Double glazing reduces this by incorporating an air gap between the panes. Air is a poor conductor of heat so the amount of heat which can be conducted to the outside is greatly reduced. Convection is the transfer of heat by air motion. 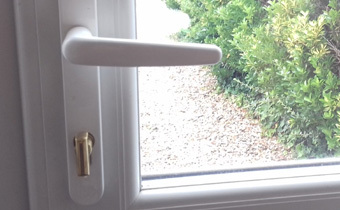 The small air gap between the panes of glass in a double glazing unit hampers air movement reducing the amount of heat transferred from the internal pane to the external one. The only possible way heat can reach the Earth from the Sun is by radiation. 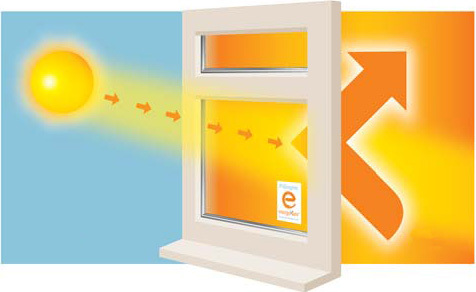 The radiated heat enters our homes via the glass in windows and doors to help warm the house. Unfortunately normal glass allows heat radiation to pass through both ways which results in heat lost from the home to the atmosphere. The glass in windows absorbs heat then radiates it again on the colder, outside surface. 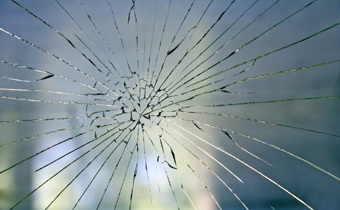 Pilkington K Glass™ has a low emissivity coating on the internal side of the inner pane of glass. The special coating is a poor radiator of heat so any heat gained by the coating is directed back into the room.